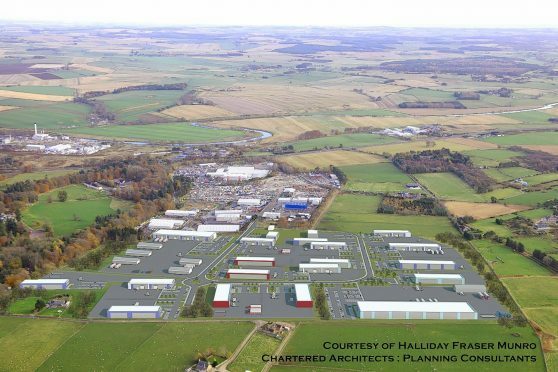 Proposals for a new abattoir at the north-east’s largest mart hang in the balance due to planning conditions, a developer has claimed. Scotbeef Inverurie plans to relocate its £17million meat processing facility from the town’s North Street to a new site at Thainstone. The plans form part of a wider scheme to expand the business park there, which has been put forward by ANM Group. Aberdeenshire Council approved the proposals earlier in the summer, but only on the basis both the Thainstone and Port Elphinstone roundabouts are upgraded. A report to the authority’s planning department on behalf of the business stated: “In the event that these conditions remain in place, it is possible Scotbeef Inverurie will be forced to abandon this project. During a consultation process, several objectors claimed the new abattoir would increase traffic near the business park. However, Scotbeef Inverurie argues any extra traffic will be at busy times, and claims the roundabout changes are unnecessary. The report adds: “The traffic generated will have little or no impact on the Thainstone roundabout, because the timing of cattle deliveries and goods despatch will be timed to operate throughout the day, and can be arranged not to coincide with the busiest times at the roundabout. “Secondly the bulk of staff will arrive from 5.30am, leaving between 2.30pm and 4pm – outwith the busy periods on the Thainstone roundabout. The report added that the move would have a positive impact on Inverurie as it would alleviate traffic around North Street.